The front exterior of Three Broomsticks in the Wizarding World of Harry Potter - Hogsmeade in Islands of Adventure. Three Broomsticks is a quick service restaurant in the Wizarding World of Harry Potter - Hogsmeade in Islands of Adventure. 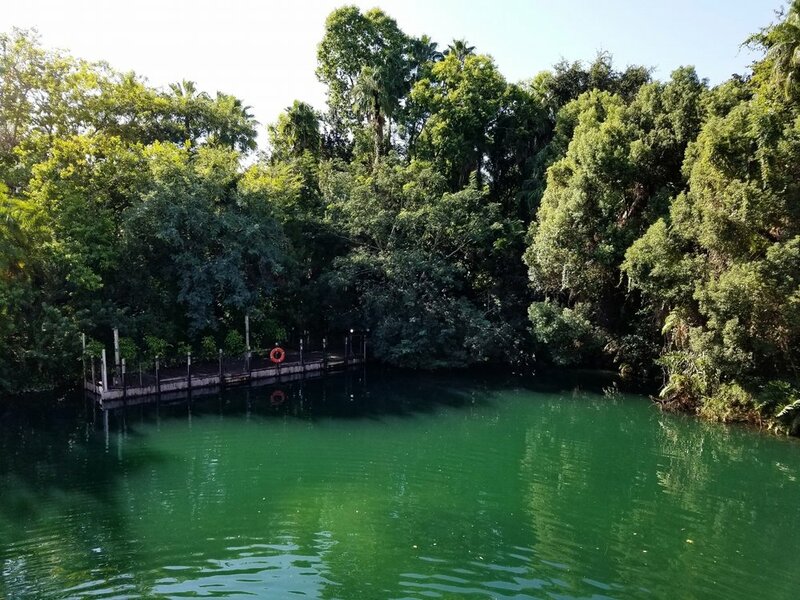 You'll find it near the Hogsmeade gate (look for the sign on the gate that says Please Respect the Spell Limits) when you enter Hogsmeade through the neighboring island of Lost Continent. Three Broomsticks is on the left side next to Honeydukes (the candy shop) and across the street from the Owlery. Another Harry Potter themed restaurant, the Leaky Cauldron, can be found in the Wizarding World of Harry Potter - Diagon Alley in Universal Studios Florida. 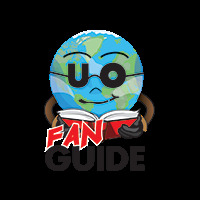 Read our Leaky Cauldron Dining Guide to learn more about that restaurant. If you look up while you're in Three Broomsticks, you'll see the portion of the restaurant that's meant to look like an inn. In the Harry Potter books and movies, Three Broomsticks is an inn and pub in Hogsmeade, a wizarding village with cottages and shops. Hogsmeade is located near Hogwarts School of Witchcraft and Wizardry, and many Hogwarts students, including Harry Potter and his friends, visited the village on weekend trips. Most of the restaurants, shops, and buildings in the theme park version of Hogsmeade were based on locations seen in the Harry Potter movies, but the Three Broomsticks restaurant is an exception. The Three Broomsticks that appears in the Harry Potter and the Half Blood Prince movie was actually modeled after the Three Broomsticks in the theme park, which was built before the movie set. Stuart Craig, the production designer for the Harry Potter movies worked with Universal Creative to design Three Broomsticks for the theme park. 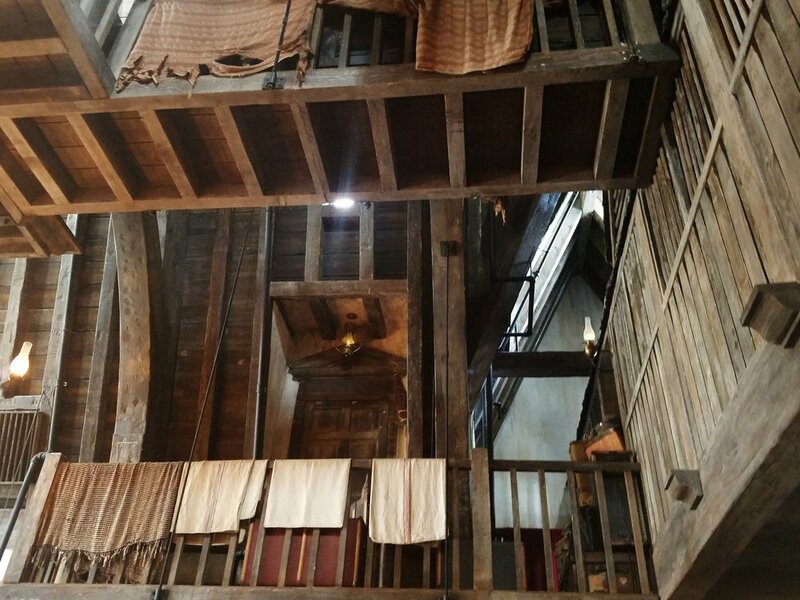 He then used the same interior design for the Three Broomsticks set in the Harry Potter and the Half Blood Prince movie. 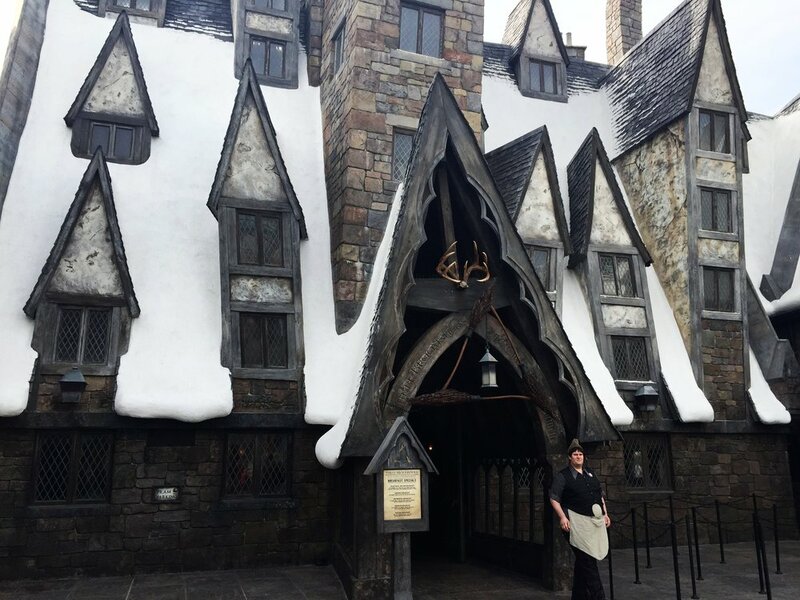 Three Broomsticks serves breakfast, lunch, and dinner. Opening and closing times vary, depending on when the rest of the park opens and closes. Three Broomsticks may not be open immediately for guests who have early admission to the Wizarding World of Harry Potter, but it typically opens 30-60 minutes after early admission begins. Breakfast is served until 11:00 am. You'll order your food at Three Broomsticks at a counter like this one. Three Broomsticks is a quick service restaurant, which means that you walk up to a counter, order your food, and then find your own seat in the restaurant. When you enter Three Broomsticks, a Universal Team Member will ask you how many people are in your party before directing you to a counter where you can place your order with another Team Member. You'll pay for your food, which will then be placed on a tray. Afterward, you can collect utensils, napkins, and condiments from a separate counter and then choose your own seat. There are two basic seating options at Three Broomsticks: indoor seating and outdoor seating. The indoor seating is located in the dining area of Three Broomsticks, and the outdoor seating is located on a back patio behind Three Broomsticks. Breakfast is served until 11:00 am. Children ages nine and under have essentially the same breakfast entree options as adults. The real difference is in the portion size and the price. The children's breakfast entrees come with smaller portions and a lower price tag ($12.39 per entree). 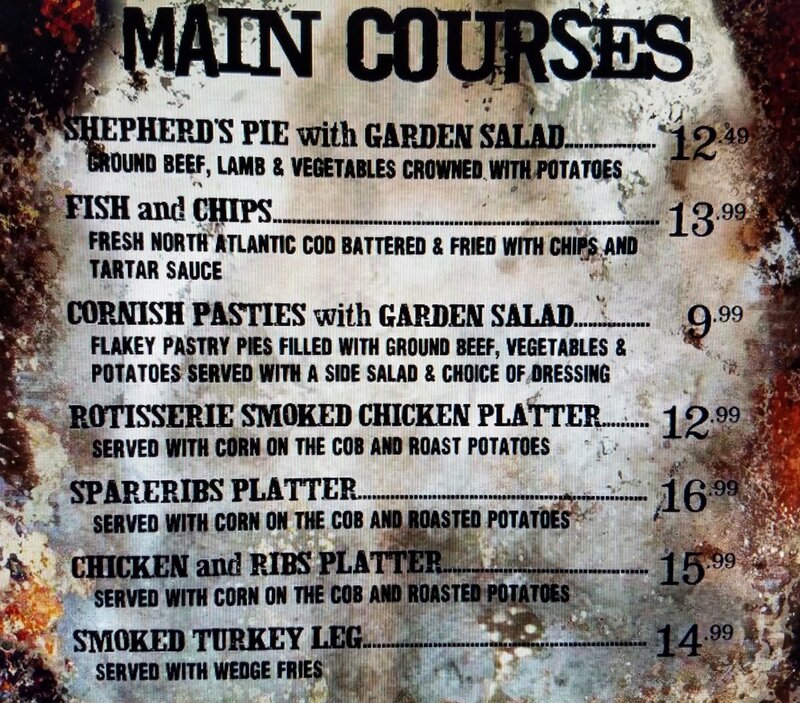 Three Broomsticks dinner menu with prices. One of the most popular menu options at Three Broomsticks is The Great Feast, which costs about $59.99 and serves four people. Additional servings can be purchased for $14.99 each if you have more than four people in your party. The Great Feast comes with spareribs, rotisserie smoked chicken, roasted potatoes, corn on the cob, and a fresh garden salad with a signature vinaigrette dressing. Three Broomsticks children's menu, sides menu, and beverage menu with prices. You can order your Butterbeer from Three Broomsticks in souvenir mugs. One mug features the Butterbeer logo, and the other mug features the Hog's Head logo. Note: you can find more alcoholic drink options next door at the Hog's Head. *Menu prices updated February 2018. The walls at Three Broomsticks are decorated with antlers. Guests who purchase a Harry Potter Vacation Package, which comes with free breakfast at Three Broomsticks or Leaky Cauldron, can make breakfast reservations at Three Broomsticks. However, other guests cannot make reservations, and in most cases, do not need them. Three Broomsticks is a popular restaurant, but it is a quick service restaurant, so you can just walk in whenever you'd like and get food for breakfast, lunch, or dinner. On the busiest days, it can be difficult to get a table during peak meal times, but wait times are rare and typically limited to 20-30 minutes of less. The Doorway. A lot of fans like to get their picture at the entrance of Three Broomsticks. They usually stand right in the doorway, which is situated beneath a trio of brooms that form a triangle. The Rafters. The interior rafters of Three Broomsticks are fun to photograph, but if you look closely, you'll see a really cool visual treat that's hard to capture in a still image: there are moving shadows in the rafters. The shadows look like dancing house elves. Antlers. The walls of Three Broomsticks are decorated with framed illustrations and racks of antlers…lots of antlers! Hogshead. A trip to Three Broomsticks isn't complete without a stroll into the neighboring Hogshead (which can be accessed from inside Three Broomsticks). You can get a great pic of the bar and the beer taps, but the best photo op is behind the bar where you'll find an enormous stuffed hog's head that actually moves and snarls at guests. View of Hogwarts. If you step out onto the back patio of Three Broomsticks, you'll find a great view of Hogwarts. This is an excellent spot to get a pic with the castle in the background. Shepherd's pie at Three Broomsticks. We're big fans of Three Broomsticks. The atmosphere makes it one of our favorite places to have breakfast or kick back with a Butterbeer. The lunch/dinner fare is also better than what you'll find at most quick service restaurants in Islands of Adventure. We have tried every breakfast option at Three Broomsticks. All of them are good. The Continental Breakfast, which comes with a lot of different fruit as well as a croissant and a scone is the most sharable breakfast. Our biggest complaint about breakfast is the price. A party of five could spend almost $100 on breakfast. 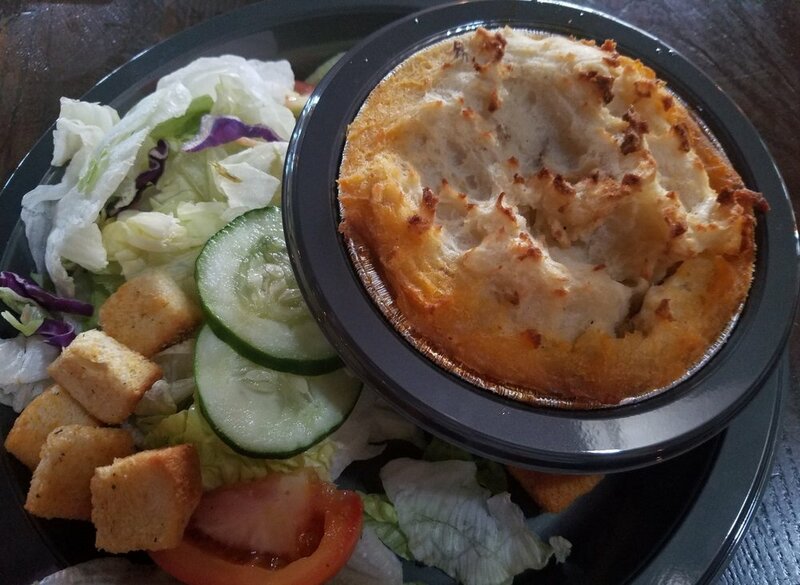 For lunch or dinner, we recommend the Shepherd's Pie, which is pretty good, though not quite as tasty as the Shepherd's Pie from Finnegan's Bar and Grill in the neighboring Universal Studios Florida. The Freshly Baked Apple Pie, which has a yummy streusel topping, is a solid dessert choice and easily sharable between two people. For deal seekers, it is hard to go wrong with the Great Feast, which serves four people for about $60. We've heard a few guests say that the Great Feast was almost too much for four people to eat, so you may be able to serve as many as five if you have a couple of kids in your group. We recommend staying away from the hard-packed ice cream in cups (one of several dessert options at Three Broomsticks). If you want ice cream, you should head over to Florean Fortescue's Ice-Cream Parlor in Diagon Alley where you can get freshly scooped ice cream. Overall, Three Broomsticks is a must visit, particularly for Harry Potter fans, who will appreciate the theming and atmosphere far more than the food. If you visit, you'll definitely want to take a stroll into the neighboring Hog's Head (which can be accessed through Three Broomsticks) to look around and try one of the specialty alcoholic drinks. You can also buy some versions of Butterbeer at the Hog's Head bar. The Hog's Head can be accessed through Three Broomsticks. According to the Hengist of Woodcroft Chocolate Frog Card, Three Broomsticks was allegedly the home of Hengist of Woodcraft, a Hufflepuff who founded the all-wizarding Hogsmeade Village to escape the persecution of Muggles in medieval times. Madam Rosmerta was the owner of Three Broomsticks while Harry Potter was at Hogwarts. Ron Weasley once fancied her. Some of the drinks that have been served to Three Broomsticks patrons in the Harry Potter books include Butterbeer, Fire Whisky, Gillywater, red currant rum, mulled mead, and cherry syrup and soda over ice. The first three drinks can be purchased in the theme park version of Hogsmeade. Three Broomsticks serves Cornish Pasties. These beef and veggie filled pastries were also served for lunch in Hogwarts on the day of the Third Task during the Triwizard Tournament (Harry Potter and the Goblet of Fire). Three Broomsticks serves Shepherd's Pie. Harry Potter ate this traditional English meat pie at Hogwarts prior to his detention with Professor Gilderoy Lockhart (Harry Potter and the Chamber of Secrets). You can't order Coca-Cola products in Three Broomsticks because Harry Potter author JK Rowling did not want any drinks with high fructose corn syrup served in the Wizarding World of Harry Potter. Butterbeer is a sweet, sugary drink, but it does not contain any high fructose corn syrup. 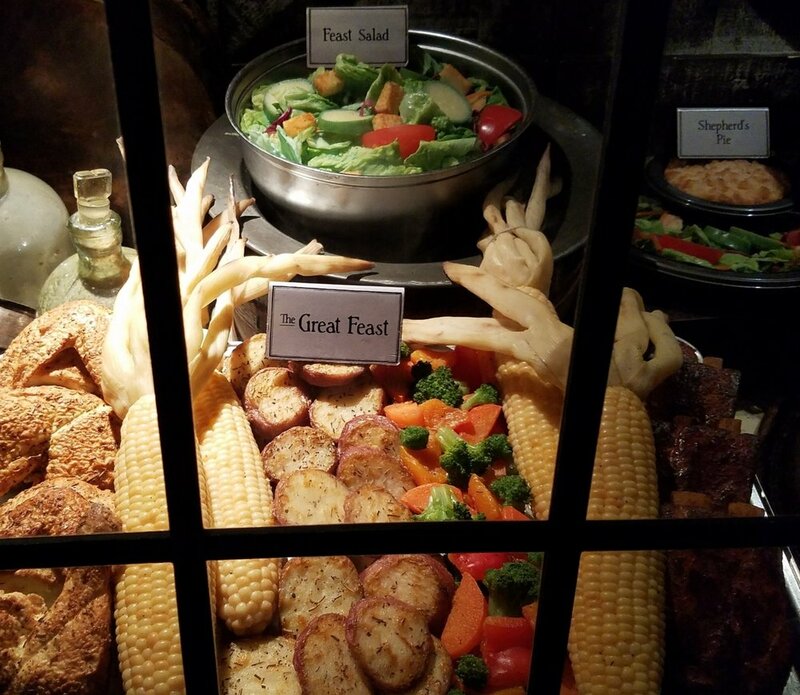 See pictures of the Three Broomsticks restaurant and food in this image gallery.